I recently spent a week being a mentor for first year’s students that are starting college in DIT. Being around these first years and seeing how anxious they were about college has inspired me to write a post on tips for getting through your first year of college. College is not as scary as you may think! I remember my first day of college, I was so scared! All I kept thinking was omg I'm going to have no friends, I'm going to be eating my lunch in the toilet or the course I've chosen might not be right for me. Thank God it wasn't like that! I ended up loving my course, making new friends and passing my first year of college! 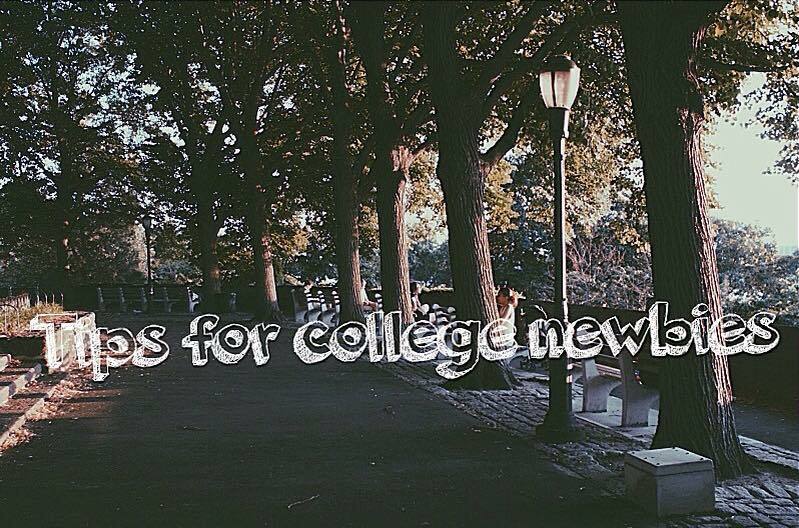 So here are few tips from me on how to get through your first year of college while also having some fun. Okay when I say join societies, I don't mean join about 20 societies and then not be able to go to half of them like I did. I actually ended up only showing up to one or two of the societies that I joined, so I would recommend signing up to about three to five societies, but you can join as many as you want. Societies are great ways for making new friends! I made lifelong friends through the societies that I joined! Joining societies actually takes away the stress from college work so please don't go through your college years without being part of a society! There are so many different societies for you to join no matter what college you’re going into! Examples - Fashion society, debating team, African society, banter society, ANYTHING! I am not sure about the other colleges, but I know that in DIT it is €2-€5 to join societies. Trust me everyone is on the same boat as you on the first day of college so talk to someone, don't just sit there on your own! Most people in your course will be feeling nervous, so there you go something to talk about! I remember my first day in college and I was thinking oh sure if I don't talk to anyone in my course, I can always meet up with a friend for lunch. No honey, it doesn't work like that. What are you going to do if you have lunch and your friends are in a lecture? So do make friends with people in your course! It's always healthy to make new friends. But don’t worry too much about making friends! As the year goes on, you’ll end up making lots of new friends through the college events, group work and societies. I wasn't going to add this in, so you would think I was cool. If you want to pass your first year of college, then do go to your lectures! At the end of the day, you're still in college to learn. By attending your lectures and making yourself known will benefit you, trust me! And if you are attending lectures, pay attention! I'm not sure about other colleges, but DIT lecturer will usually know all their students as the lecture room is not that big, and they don't put many students in a lecture. I personally believe that if you want to enjoy your college years, getting out of your comfort zone and just trying different stuff is the best way to go. Try new things, speak to someone new, or even go to a new place for lunch. I would’ve never imagined myself speaking in front of 310 students without having a nervous breakdown. I am so used to always being the girl you’ll see hiding her face at the back of the room. Use this time to push yourself out of your comfort zone and have some fun. Don't be like me that leaves an assignment to the very last minutes or forget about it completely! I would say around two to three days of getting your assignment, do start doing your research! That gives you plenty of time to ask your lecturer any questions or go to the library to get some books before they are all taken! If you are finding your assignment to be difficult, please don't just decide not to do it! E-mail your lecturer, ask for help from your peers or anything! These assignments will benefit you so much during exam times. It is very important to remember to balance your college life with social life. Now don’t get me wrong I’m not saying spend your whole college life in your room studying, you deserve a break! If you have given enough time to college work, finished all your assignments and went over work you did not understand, then you’re free to do whatever you want. So ladies if a guy is asking you to Netflix and chill when you know you've got assignment due the next day that is nowhere near done, kindly reject that offer! I know I did say attend all your lectures, but if you really need to take time off then do. Now I'm not saying be gone for two months! But if you just need to breathe and get your head straight, then take a day off but make sure you catch up on the work you've missed out on! If you are planning on taking a day off, then try to make it on a day you haven't got many lectures on! Don't buy your books just yet! I went through my first year of college without spending a cent on any book. The books you need are usually in the library for you to borrow, but make sure you return or renew them on time to avoid a fine! As well as that, your lecturers would usually put your notes on web courses so you're sorted. I mean the books you're buying do cost a lot so do wait a while before you go purchasing a book. Please please don't go through college feeling crap and not talk to someone. If you feel the pressure of college or anything might be getting to you, then do talk to someone! Talk to a friend, a family member or a counsellor! I'm pretty sure the health services in Dit is based on the second floor in Aungier Street. But for you all that are not based on this campus, make it your duty to found out where the health services in your college are based! I cannot stress the importance of saving! If I could go back, I would tell myself to stop spending my money on food and save it! You don’t want to go through your first year of college not being able to have fun simply because you’ve spent all your money on food. Especially like me if you’re unemployed and depending on SUSI, Plan yourself! Do get a part time job. You know you’ve got to print out notes, pay for bus fare and still want to be able to have some fun with friends, so don’t do what I did and spend all you money in a week buying God knows what. If you can bring food from home, DO IT! It will save you a lot of money rather than spending almost a fiver every single day. I hope you enjoyed reading this post, do remember to have some fun, make friends and laugh a lot!